I am sure everyone reading this knows the story of the evolution of Rhythm & Blues from Black gospel music and the secularization of church music by Ray Charles and others. Prior to this break, along with jazz, gospel was the innovating force in American music. However as R&B developed and became Soul (and then Funk), gospel lost its place as the leader. For a while it stuck to its sound and musically became pretty stagnant. While people like Andre Crouch brought gospel much commercial success and a wider audience, musically there's been no one on par with James Brown, Sly Stone, George Clinton, Prince, Quincy Jones, etc. But what there has been are moments, reactions to whatever sound was reverberating in Soul. In the Seventies, gospel funk takes hold. Vernard Johnson pioneered gospel sax, with sounds that, at times, echoed Albert Ayler. Later, gospel rap took hold. Between gospel funk and gospel rap, there was another reaction happening. That was gospel's response to modern soul, i.e. the music of Prince, Cameo, Rick James, Lakeside, Gap Band, Zapp, etc. For the random music fan, this is not a genre I recommend jumping into. Like modern soul, the gospel reaction has a much higher miss ratio to the hits. Though there are great songs in the genre, I have yet to find an album as back-to-back great as Zapp II or Price 1999. Nothing close to Cameo's Knights of the Sound Table or Rick James Street Songs. Could be lurking out there but I haven't come upon it. I have found the mod gospel equivalent of Gap Band 8 and the Mary Jane Girls LP (unfortunately in quality not content!). But I have found a handful of really great songs. Take the title cut from Carey Foster's (only?) album Somewhere Along the Line. 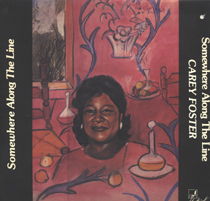 Backed by keyboard and drum machine, hanging on a single riff, Foster's "Somewhere..." sounds like it came from the studio of Sly Stone (think Little Sister). And check out the backing vocal aping Sly's guitar before engaging in some killer singing. Foster goes between sing talking and gospel wailing with perfection. Listen to this a couple times in a row and you'll be bouncing up and down, trying to sing along with the background singers. Great song. Unfortunately, nothing else like it on the album.